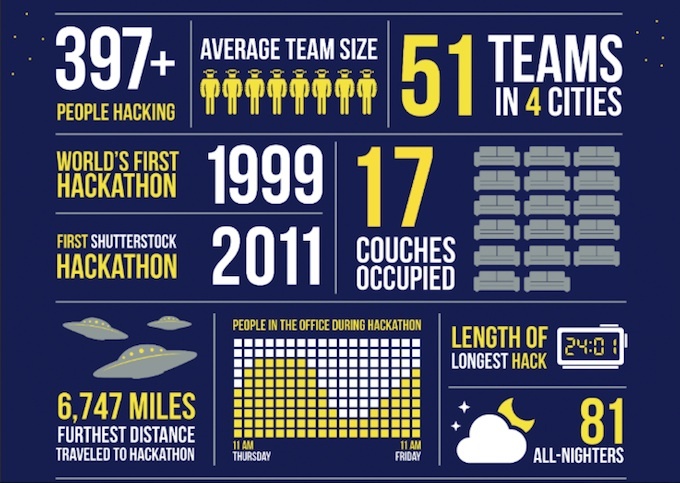 Here’s a weird confession: Until last week, I’d never been to a company hackathon. Obviously, I’ve been to hackathons, including the ones TechCrunch hosts before our Disrupt conference. But I’ve never made it to one of those company-wide events that large organizations like Facebook hold as a way to develop new ideas and stay connected to their startup roots. So when stock photography (plus video, plus music) company Shutterstock invited me to its hackathon last week, I was happy to catch up with the company’s executives and see some cool projects, but I was also just interested in getting a taste of how these events actually work. However, I did get to see the early stages of the event, as different employees milled around — eating, drinking, and tossing out ideas. Despite the giant countdown clock projected onto the wall, everyone seemed pretty relaxed. One thing I hadn’t expected: The extent to which people were perfectly happy to hop from team to team, offering a little bit of their expertise to multiple projects. Another surprise: The team leaders who said they’d been eagerly awaiting the hackathon, because it gave them time to focus on projects that had long been on the backburner. Shutterstock CTO Jim Chou and Vice President of Product Wyatt Jenkins told me that one of the unofficial rewards for winning the hackathon is a chance to continue working on these hacks, turning them into real Shutterstock products. The company pointed to its Suggested Images feature in Shutterstock search, its artistic grant program, and the yet-to-launch Compositor tool for combining Shutterstock video and music as products that emerged from hackathons. As you may have gathered from those examples, hackathon projects don’t have to be technical — there can be marketing campaigns, or other projects that don’t require writing any code. One of the goals, Jenkins said, was to connect Shutterstock employees who might never otherwise speak to each other. In fact, one of the rules of the hackathon is that team members have to come from at least three different departments. There were 397 participants, compared to 183 last year. There were 51 teams, up from 36 last year. Ten of those teams had members in more than one office. There were 29 “code-based” hacks and 22 non-code-based hacks. 81 team members pulled all nighters. The winner this year was an ImageOptimizer tool for “enabling customers to see which images work best for their audience,” so maybe we’ll see that on Shutterstock sometime soon.